Source: Peter Kennedy; published in English Dance & Song, June 1948, Volume XII, No. 3. B1 #1s keep Swinging (16) (second time through #2s, etc.) - time to show your skills! 64 bars - repeated 32 bar tune. The original tune is often used in medley with other tunes. There are lots and lots of grace notes in the version of the tune printed with the article. Peter Kennedy put them in intentionally to draw people's attention to the fact that musicians in earlier centuries did not play the tune straight, but embellished it in many ways. 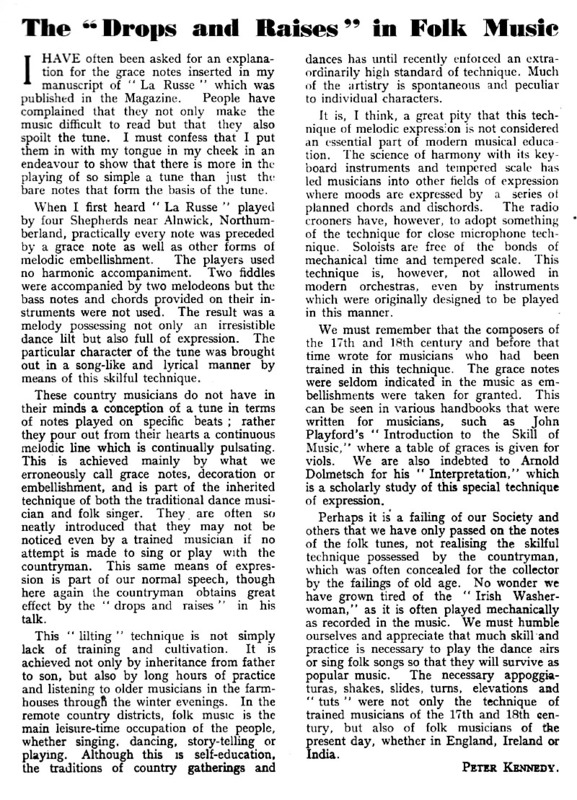 His article on this subject is below: The "Drops and Raises" in Folk Music. Whether the balance is a Set or a Step/Kick. Which shoulder you pass by in A1 and A2. Whether the inactive couples join in with arched dip and dive crossings, interleaved between the active couples' crossings. How the couple turn after the crossing. Turn Alone (towards each other, individually on the spot) is the easiest for beginners doing the arches. Turn Alone (away from each other, individually on the spot) gives nice flow if you are passing outside without arches. California Twirl is very common amongst experienced dancers. the Wheel Around (as a couple) was the standard in 1950, before arching became common - it is the slowest way to turn and I would not recommend it if you are doing arches. Was it ever really called "the English Quadrille"? I suspect it is more likely that the reporter was told that it was AN English Quadrille, but wrote whatever they wanted, as all good reporters do. 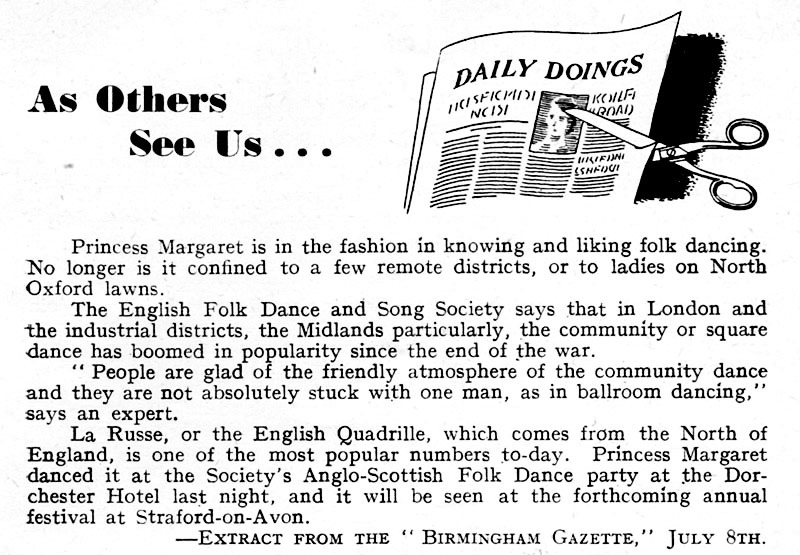 You can see it being danced beautifully at a 1950 EFDSS festival in the video "Wake Up and Dance" which is on the "Here's a Health to the Barley Mow" DVD. 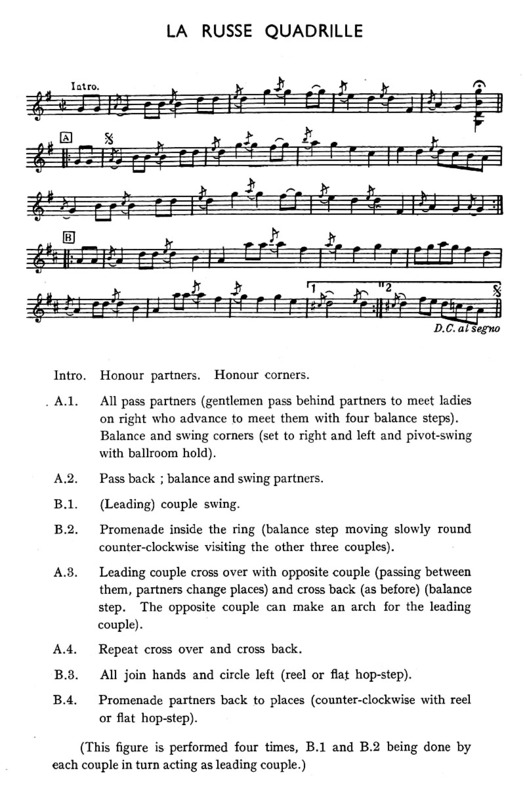 In that version, in A3, the leading couple promenades between the opposite couple then wheels around and separates, while the opposite couple pass individually on the outside of the leading couple, take promenade hold, then wheel around - no arches to be seen! 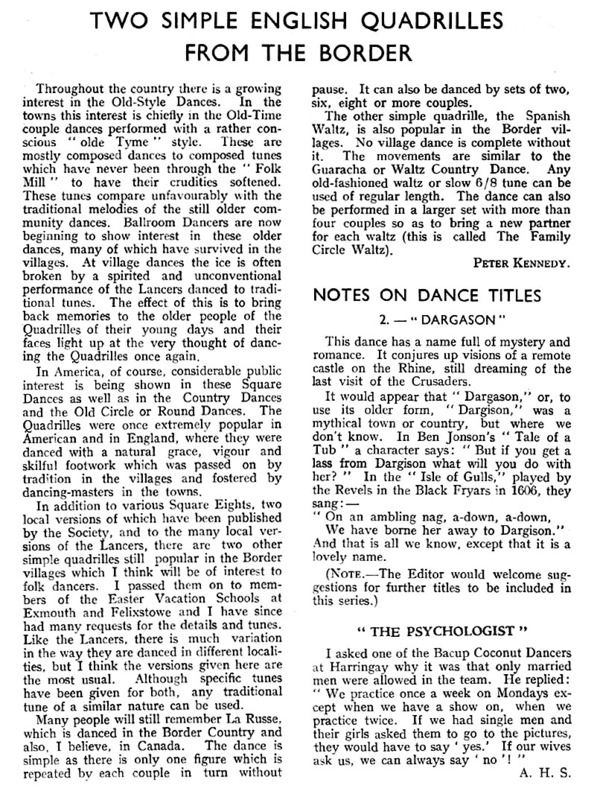 As you can see in the article, La Russe was collected in the North-East of England, and it is still danced there, with many people claiming it to be a local dance. You can see Burt Hunter calling it here and admitting that it goes back to the 19th century. The first publication of La Russe that I know of is by H.D. Willock in his "Manal of Dancing" published in Glasgow, c.1847, 61 pages "Calls are given for eight sets of quadrilles and two single quadrilles, La Russe and the Waltz Cotillion. There are also descriptions of fourteen couple dances, four reels and twenty-nine country dances, ten of them to Scottish tunes." There is no music provided in this manual. Each line is eight bars. You can see a detailed interpretation of this, and the words from a slightly later version, on Colin Hume's page, plus a discussion of what "poussette round" could mean. The modern Scottish Version is closer to these original words than to the modern English version. This dance was presented with The Spanish Waltz under the title "Two Simple Quadrilles from the Border"; the article is included below.